Here are two new encaustics that I did in the past two days....It was hot in the studio, but I was happy to finally get in there and crank up the hot wax and hot plate. I am selling my jewelry at an Italian Festa on Oct. 11th and decided to do a few encaustics that somehow related to my Italian, sicilian heritage. I loved the photo but never knew what to do with it. 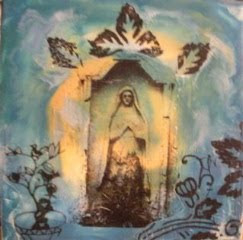 I this piece is another addition to my nichio, madonna, goddess series. 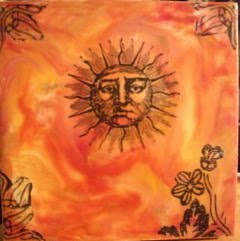 The Sun is just a lovely old middle ages etching that I photo transfered onto an encaustic background. I plan on writing Buon Giornio on it with carbon paper or?? not sure yet. I have to say that I was excited to get back to my wax work after just not being motivated for quite a while. I think its the fall that gets me going. Blue and orange are colors that keep calling me these days. I put beeswax on about 4 more small masonite panels as well, so we shall see where I go next with my Italia series. Horray... I am having waxy joy buildup!